Olympians and former “DWTS” winners Apolo Ohno (Season 4) and Shawn Johnson (Season 8 ) will show off their fancy footwork again this season, along with fellow champs from seasons’ past: former 98 Degrees member Drew Lachey (Season 2), former Dallas Cowboy star Emmitt Smith (Season 3), Brazilian race car driver Helio Castroneves (Season 5) and soap star Kelly Monaco (Season 1). Actresses Pamela Anderson (Season 10) and Kirstie Alley (Season 12), French actor and finalist Gilles Marini (Season 8), and former ‘N Sync singer Joey Fatone (Season 4), are also among this season’s high-wattage alumni in the competition. Bristol Palin (Season 11), daughter of former Alaska Governor Sarah Palin, and TV personality Melissa Rycroft (Season 8 ) round out the pack. In another first for the show, the 13th contestant will be decided by America in an online vote. Choose from three former contestants- fashion commentator Carson Kressley (Season 13), singer Sabrina Bryan (Season 5), and Disney Channel star Kyle Massey (Season 11). Who would you like to see cast in that 13th spot? For more information, and to cast your vote, visit abc.com. 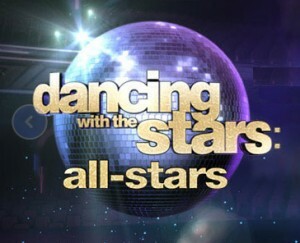 The two-hour season premiere of Dancing With the Stars will air Monday, Sept. 24 at 8 p.m. ET.